Are Rising Costs Forcing the Need for Pet Insurance? Pet Insurance is a topic covered this week on NPR. The topic is called "Health Insurance: Now for Your Dog, or Hedgehog." Few news stations report on health topics as well as NPR, or even offer such varied topics that matter so much to animal owners or care-givers. It was only a matter of time before we were updated on the latest information concerning insurance for our pets. Many of my clients have related the exorbitant costs they have faced with a pet's medical bill. Many love their pets and do not want to place a dollar limit on what they will spend...but that isn't a realistic or pragmatical way to view the issue of pet care. Pet Insurance is making a strong push forward in our society. At present, the average annual cost for pet health-care is $80.00. In fact, pet-patient,owner, and veterinarian experience a medical relationship much like Americans did at one time with their own health-care. Yet, it seems that medical advances and the rising cost of pet health-care will be bringing the insurance question for animals into our own homes. Go to NPR to get the full story. The story is fascinating. Prevention of heart disease or reversing heart disease concerns me partly due to the fact I have two older dogs. So much of what we have learned in preventing heart disease in humans can be applied to our animals as well. For the most part, you can spot the older pet in a park. The younger ones are giving their owners a "run for their money" with their endless bounds of youthful energy. The older dog usually walks along with his owner at a 'contented pace'. Our older companions are glad to take breaks and simply enjoy the sun, and the interesting "smells" in the air. It is not at all unusual for your older dog and cat to sleep 70 to 80 per cent of the time. Naturally, we all need to be thinking of how at this older stage of life, there are less calories being expended by your pet, and with this slower metabolism, it is time to carefully watch their caloric intake. There are plenty of natural dog foods on the market that can help prevent heart disease, and decrease the harmful affects if heart disease symptoms have already been presented by your pet. You can ask your veterinarian for recommendations, and you can certainly search the internet for pet food designed just for the older pet! Call Merry Murphy Pet Sitters at 704-246-4148 for all your pet sitting needs in Charlotte,N.C. I have been listening to the March 19th NPR re-broadcast of "Veterinarian Translates Barks and Meows" this week, and have been entertained, moved, and educated. I particularly like how Dr.Nancy Kay covered dealing with the "end of life" decisions we face with our pets. Kay breaks down probable scenarios and the typical reactions pet owners are likely to have and the consequences of each action. What is so good about the information is the way Kay gives common sense approaches to dealing with events that we have or will face one day. One of our biggest challenges when dealing with the question of "Is my dog in too much pain?" is to consider this: You know how it feels to be in bed with the flu. If you had to live with this pain constantly, would it be worth it? Certainly, each of us have our own unique situation simply because it is our own personal experience with our best friend. Yet, we all need assistance and more information when dealing with our pets. For your pet sitting needs in Charlotte,N.C. call Merry Murphy Pet Sitters at 704-246-4148. Please visit our website! I wrote a few days ago about the subject of saving money during the recession and ways veterinary care can be planned with preventive care to save money during hard times. Reports from vets in Charlotte are grim to say the least. Unfortunately, many vets are reporting drastic cuts in pet care, noting longer stretches between visits. Meanwhile, the lack of preventive pet health care is leading to more expensive care, once the medical problem has got out of hand. For instance, reports of not preventing heart worm in animals leads to several hundred dollars being spent once a pet is critically ill.
Once thought to be recession proof, managers of veterinary clinics say they can tell we are in a recession simply by the questions clients are asking about pet care. Merry Murphy Pet Sitters, 704-246-4148, for pet sitting in Charlotte, N.C. I have a pet dog that I rescued a few years ago that has anxiety attacks when the thunder begins to sound during a storm. Pets have been subject to storms more this year in Charlotte,N.C. than any year I can remember in recent memory. So I tried to implement a little of Caesar's techniques for dog phobias, and then ran into this article on Science Daily. Basically, research done in 2006 says: "A new study shows that dogs can get very upset during thunderstorms, whether or not their owner holds them. The study measured the stress hormone cortisol to be up to three times normal levels while the dogs heard recordings of a thunderstorm. 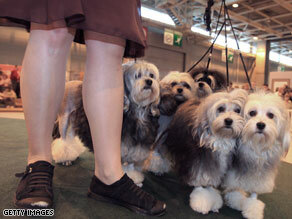 The company of other dogs did help, though vets say medications may be more effective". Since I have another dog,Murphy,perhaps that has kept Sadie's symptoms from getting too out-of-hand. I think at this point we can forgo the medication, but it is something I will keep in mind if my dog's symptoms get any worse! For pet sitting services call Merry Murphy Pet Sitters at 704-246-4148, or visit our website. Due to the fact that older cats do not handle stress as well as they did when they were younger, many vets recommend using a professional cat sitter who will check on your older cat at predetermined times. Boarding a cat at a facility is fraught with anxiety; so if at all possible, hire a pet sitter who will you help you out if you need to be away from home. A lot of people think there is simply "nothing" to caring for an older cat. Actually, playing with your older cat helps to keep his weight down and can delay worsening of arthritic-type symptons. Brush your cat's hair daily, and look for any lumps. If any are noted,make an appointment with your veternarian. Cats are prone to more growths (tumors) than are dogs. Many times, especially in cats, these growths tend to be malignant in the older cat. Finally, keep plenty of water around for the senior cat. Older cats do not go out of their way to get water, and will benefit from you strategically place small bowls of water around the house. Enjoy your pet! Time is a precious commodity! You can call Merry Murphy Pet Sitters in Charlotte,N.C. for pet-sitting, dog-walking, and other pet services in Charlotte,N.C.